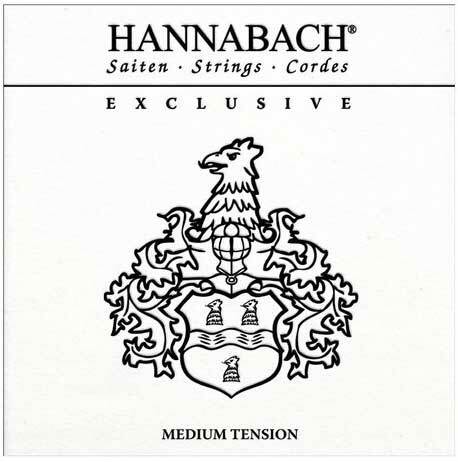 TheSeries Hannabach Exclusive - Premium strings for classical guitar. This set originates from the contribution and help of renowned musicians who worked together with us to create this perfect combination of material in an exclusive set. The strings combine traditional craftsmanship with high-tech materials and technology. The basses are made with a new material which has fantastic qualities in its elongation which in turn creates the right tension for quick and perfect tuning, unrivaled sound brilliance and crisp and easy tones together with an outstanding durability. The wire is made with a much higher silver content to ensure a long lasting perfect playing feeling. The trebles are a combination of high precision round nylon monofilaments for E1 and H2/B and a Titanyl third string to ensure a perfect transition from the upper to the lower register.